Alfa Romeo 75 PDF Workshop and Repair manuals, Wiring Diagrams, Spare Parts Catalogue, Fault codes free download! Alfa Romeo 75 1987 Repair Manuals – Manual for the repair and maintenance of Alfa Romeo 75 vehicles since 1987, equipped with Twin-Spark four-cylinder gasoline engines of 2.0 liters capacity. and six-cylinder petrol engines V6 working volume of 3.0 liters. The book is based on the experience of the service station and contains vehicle specifications, descriptions of repair of individual components, troubleshooting, and recommendations for the maintenance of Alfa Romeo 75 cars. The manual contains overview and detailed drawings, an easily accessible form of description of repair procedures for all vehicle components of different versions versions with manual transmission, power steering and anti-lock brakes controlled by electronics. In the appendix of a manual all data on the sizes, adjustments, efforts and the basic schemes of an electric equipment (electroscheme) of the car are resulted. Alfa Romeo 75 (in the USA – Alfa Romeo Milano) is a sports medium-sized sedan produced by the Italian firm Alfa Romeo between 1985 and 1992. 75 was commercially successful enough, 375 257 cars were produced within three years  and by 1992 the total number of cars produced was about 187,300. 75 was introduced in May 1985 as a replacement for Alfa Romeo Giulietta and Alfetta (with which it has many common components), and was named in honor of the 75th anniversary of the release of Alpha cars. The body was made in the form of a shock wedge, tapering to the frontal part with rectangular headlights and a matching radiator grille. Feature 75 were some non-standard technical solutions, especially interesting is the fact that it was almost perfectly balanced by the ratio of “back / forward”. This was achieved by installing a 5-speed gearbox at the rear, connected to the rear differential (so-called Transaxle) borrowed from the Porche 911. The rear disc brakes were installed on the transmission casing. The front part of the suspension – a combination of a torsion shaft and shock absorber, and at the rear – an expensive suspension “de Dion” with shock absorbers; This choice was due to efforts to optimize the controllability of the car. The crankshaft of the engine is connected directly to the propeller shaft, which ran along the bottom of the car from the engine to the gearbox, and rotated at the engine speed. The rotating segments were connected by elastic couplings to prevent vibration and damage to the engine and the box. 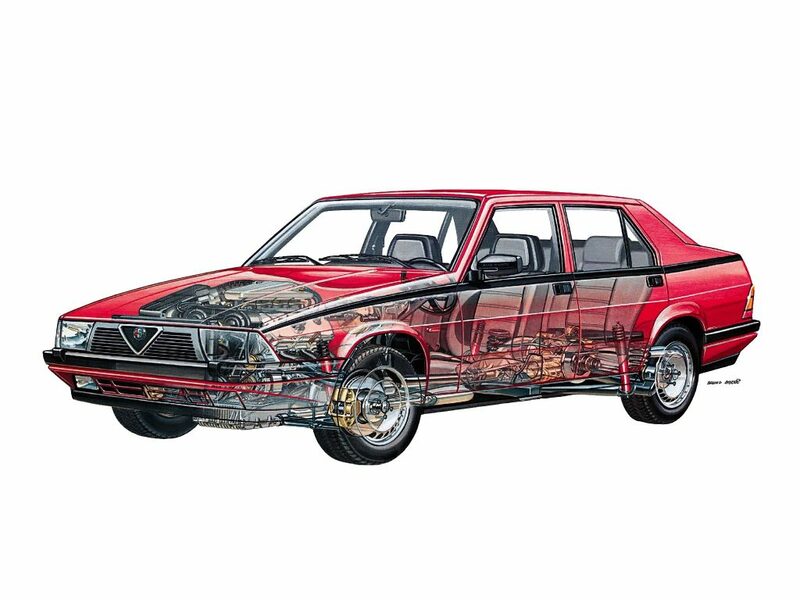 The range of engines at the start of sales included 4-cylinder 1.6-, 1.8- and 2.0-liter gasoline carburetor engines (Twin Cam), a 2-liter turbo-diesel with an intercooler, and a 2.5-liter injector V6 (Busso). In 1987, a 3.0-liter V6 (Busso) was added. However, in North America, only Milano cars with 2.5 and 3-liter V6 engines (Busso) were sold, from 1987 to 1989, and also 1.8T (turbo). For its time, the interior stood out with an advanced diagnostic computer that monitored the systems and warned drivers about potential problems and malfunctions. At the Geneva auto show in 1986, a prototype of the Alfa Romeo 75 Sportwagon was shown, a tempting prototype of the later 156 SportWagon. The release of this version was canceled after the acquisition of Alpha Fiat.